An estimated one billion passengers are carried on railway journeys each year. In the UK, despite spiralling costs, it’s an important part of everyday life for many people. According to ONS figures, the Office of Rail Regulation states that total private investment in the railway industry has plummeted from £881m six years ago to £503m in 2011/12. Passenger journeys increased 7.8% in the last 12 months and by 27.5% over the last five years. In particular, London and South East services saw the highest increase last year of 8.3%. Rail audiences are affluent and influential with 75% ABC1 and 57% Business Decision Makers. All of this makes a great case for advertising on the railways which comes in various flavours; outdoor digital formats with Transvision (huge LED screens), posters and billboards. As you might expect, the value of this advertising space is significant. In 2009, Primesight purchased Titan Outdoor in a multi-million pound deal, which included half of its assets made up of its Network Rail contract – the largest stock of roadside billboards in the country. The interior advertising assets of the railway is another story altogether. In 2010, Network Rail renewed its existing contract with JCDecaux for advertising on the interiors of its railway stations – a five year deal valued at £160m. That deal included all rail-facing ad sites across Network Rail and the 18 Network Rail-managed stations. Who exactly is JCDecaux? Well, they are an extra-ordinarily large advertising organisation. JCDecaux is unashamedly the top global company in “street furniture” (what we might call advertising panels), transport advertising with 175 airports and 280 contracts in metros, buses, trains and tramways, European billboards and outdoor advertising in the Asia-Pacific region. To put this in to some kind of context, those areas alone amount to more than 1,000,000 advertising panels in more than 55 countries. With revenues in 2010 of almost €2.5bn, what austerity afflicted industry is this you may ask. Part of the reason is JCDecaux’s incredible ability to negotiate massive advertising contracts – often 15 years long – in France, Hong Kong, Netherlands and many other places. In 2012, the OFT came down hard on JCDecaux for sharp practices in the UK and for lock-out clauses which resulted in a raft of measures to change their business practices. This year they managed to force LOCOG to remove their billboards and have their questionable Paddy Power billboards returned around the Olympic site. 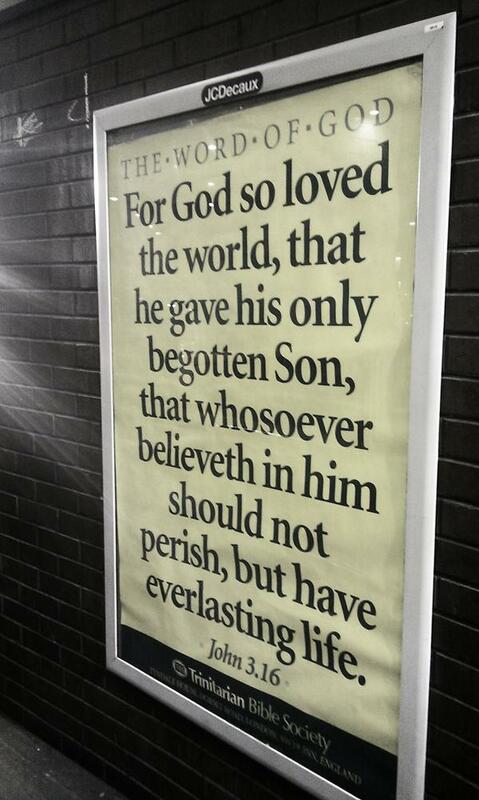 In the UK, an organisation called the Quran Project planned to place posters in 5 major London Railway Stations – Waterloo, Victoria, Liverpool St, Marylebone and St Pancras International during the 10th– 24th December 2012. The Chairman of the UK registered charity, Dr Wleed Haq tells me the billboard campaign was designed to tackle the causes of Islamophobia in the UK by distributing 1,000 free copies of the English translation of the Quran to non-Muslims. To date, the charity has distributed 50,000 copies since its formation 2 years ago. A similar campaign called The Rail Dawah Campaign 2011 was run across across Midland Railway stations (also Network Rail) in December 2011 without objection or complaint. The London railway posters went up at different times between Mon – Thurs last week. The campaign had been 6 months in the planning and the sites were reserved by JCDecaux who had approved the campaign, at a cost of £30,000, two thirds of which was raised online with JustGiving, a popular crowd funding platform. At Marylebone, the Quran Project poster was taken down after only one day. As it currently stands, the rail companies, Network Rail and JCDecaux cannot sustain any claim in relation to a policy of no religious advertisement on their assets. The point of complaint may well be with JCDecaux, for whom business has been brisk with revenue for the first nine months of 2012 already totalling €1,876.2m. Like every user friendly, cut-throat global organisation, JCDecaux has an ‘ethics policy’ and even a ‘Group Ethics Committee’. The policy states that the committee is chaired by Chairman of the Audit Committee, one Xavier de Sarrau. It may even be that the complaint from the Quran Project may reach Monsieur de Sarrau. Sadly, this may be difficult. Xavier de Sarrau is stable mate and closely allied to Sarkozy and the Fouquet powerbase, he has accompanied the former President on more than one occasion, is listed as a friend and even went to the White House dinner with him. It’s probably fairly safe to assume not only his political persuasion but also his view of multiculturalism, let alone the overt presence of Islam in society. This in itself must raise questions about how we go about tackling pandemic Islamophobia, if policies and those who police them are not only beyond reproach but advocates of such prejudice. In the end we have the irony that an anti-Islamophobia campaign has been entirely derailed by precisely the potentially discriminatory policies of Network Rail, JCDecaux and the railway companies, which they are attempting to challenge in the first place. Couldn't JCDecaux be challenged under Equality and Diversity legislation? As you have seen this email please say what exactly they think is not acceptable? The Quran project is Saudi-funded. Saudi Arabia does not allow any religious freedom, let alone advertising whatsoever – even owning a Bible there is illegal. So Saudi-funded religious proselytising deserves to be treated the same in Britain – i.e. prohibited. If you deny other people rights when it suits you, then you have no moral right to complain when they do something similar (albeit much more mild) to you. If you refuse to let others live in your house as they wish, then you have no right to live in someone else's house as you wish. The lesson is: be done by as you did. If you are a selfish hypocrite, don't be surprised if other people don't extend you the courtesy you refuse them. I think the figures saying that us British whites are now in the minority in London may have been a reason. Brothers! This is exactly the reason why the effort of dean needs to be made in the fashion and the manner adopted by muhammad saw. Dawaat should be given to the non muslims but they point out that if islam is so good and has solutions to all the problems inflicted on ummah then why arent the muslims practising islam? The effort needs to be made on muslims so that they practice islam in the tarika and manner that naby saw tought. Once the muslims practice islam im its entirety then the non muslims shall be attracted to the islamic way of life. After that what else what else can the non muslims do other that to accept the pnly true religion in which Allah swt has kept success foe both the worlds- in this dunya and the hereafter. Yours dai-illalah! BTW I know there are also Christians who do and say obnoxious things, but you Muslims definitely have more than your fair share of such people. Why is that? 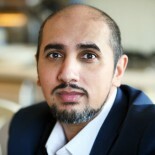 The Quran Project does seem to be quite heavily Wahaabist and Salafist influenced though who have a very literal approach to Islam and along with Saudi Arabia Government as well they have literal approach to so there is a connection of sorts there. Lets not forget Saudi Arabia influence on America as well here..
Muslims are the new Liverpudlians. They get offended by anything. How about all religious advertising is banned? Keep it in house and stop offending us atheists, or non believers or INFIDELS! Please can anyone provide more hard info on exactly which posters have been pulled and precisely what explanation(s) have been provided, if any. Is it true that they are going to be put back up? My sense at the moment is that this seems to be a case of laws/guidelines being applied selectively, and thus discriminatorily (although this may not be the intention). I'm assuming they haven't been pulled because of specific objections to organisation behind the ads? Thanks. Mohammed: can you quote more of the letter, and specifically what is not acceptable? At present this reads like very selective quoting. Anon talking about Saudi politics: Britain should lead by example, not follow the lead of oppressive regimes. Tommysize: I don't follow why nationality or skin colour should affect what advertising is acceptable. And while “white British” may be just less than 50% of London, it's still by far the largest group. Plus, if that means Muslims are more likely to be attacked in London, I think that's a bloody good reason for the adverts to be in London. Anon talking about Islam: I'll admit little of your comment made sense to me – I know little about Islam – but I'm suspicious of anyone saying “if only you all did X better, like I do, everything would be fine”. I've spoken with the Chairman of the Quran Project and he confirms that JCDecaux have u-turned and the ads are going back-up. The only non-Network Rail station, Marylebone (which is run by Chiltern Railways), is sticking with its decision to pull the Quran ads; despite complaints that they have advertised the Alpha Course there. @ tommysize1: Some of us white Brits felt less embarrassed to call ourselves British when we saw those ads. Just because we live on an island do we still have to be so insular? We should have got over this laughable suspicion of foreign-ness and other-ness three generations ago. Kebabs & curries vie with fish'n'chips and shepherd's pie in popularity. We no longer refer to Frogs, Krauts, Yanks, darkies and so on. Our kids share lollipops with kids of every colour and creed. We've been transformed from a colourless grey little nation into a dazzling rainbow mosaic and London has become one of the most vibrant, tolerant metropolitan cities in the world. Nobody with any faith and confidence in their own culture, religion or national identity would feel threatened by a billboard or two in the jungle of ads at a busy railway station. Quran project is not saudi funded. Did u read the article? .. if it was they wouldnt be asking for donations online. Another British proud of its country which is good but yet at the same time so thick bad stupid. It's ok to put your point across but please use some proper facts. What is the reason tommy? I see the figures in dubai which states there are more whites than Arabs working there?? Everyone works everyone for a better living. Its just life. Re anon last time I looked this society was all about freedom of expression which distinguishes it from autocratic regemies like Saudi. But let's not also forget that these counties have the backing of the West so they can mainatain the status quo and suffering of their people. Easy, ur not making a distinction between Islam and Muslims. They are very different things. Focus on learning Islam. Ignor Muslims. I said in my tweet dialog with you that I was still at the information gathering stage on this story, and you’ve suggested it’s all on your blog. • Your blogpost title directly references Islamophobia. What I don’t see is anything that actually explains why the ads were apparently pulled only to be been given a go ahead a day later. We have your view presented, but am I missing any reasons that have actually been expressed or explained by JCDecaux or whoever is responsible for making these decisions? This is why I had wondered if perhaps there are elements of the story as yet unrevealed? • I’m always nervous about reading fragments of email without the full context. I wonder if we can see more of the email dialog you shared from someone at JCDecaux? • You have said that was designed to tackle the causes of Islamophobia, but I wonder if the poster campaign is a particularly effective way to battle Islamophobia? (You could even put together an argument that it could have quite the opposite effect) Would it not be more correctly labeled an evangelical campaign on behalf of Islam? Yes I agree, it would have been informative to find out JCDecaux' line of reasoning for taking them down temporarily (which is now what has happened). I would like to ask though… if the campaign is to tackle islamophobia why has it been timed to coincide with the Christmas period? A Christian group doing such a thing in a muslim-majority country could/would be interpreted as stirring, no???? Also, as Tom Holland, presenter of 'Islam: The Untold Story', has pointed out some of the ads (not the one in the pic above) are making implicit digs at the Bible by saying 'Never Changed, Never Altered'. I have lived a number of years in a muslim-majority country where I was constantly harangued for being a non-muslim with the logic that 'you changed your holy book, thus our religion is superior to yours' (on the assumption that I'm a christian which in I'm not). Thus in summary I feel that neither should JCDecaux have pulled the ads after accepting the campaign. And on the other hand quranproject.org should be more respectful in their missionary activities: don't time it to coincide with another religion's important festival and do promote your holy book/religion through it's own virtues not by making digs at another religion. People are not fooled. On the contrary another nail is driven in the coffin of multi-faith relations by those who constantly bleat on about islamophobia. I think people should be free to proselytise (maybe ideally avoiding triggering unnecessary sensitivities)- and I agree that is a quite different matter from tackling Islamophobia. I agree that more needs to be known about this – I find it highly unlikely that crude Islamophobia is at work – though I don't blame people who have come to such a conclusion based on the rather confusing evidence. It seems clear from the email that some explanation was given – what was it!? Thanks for sharing it.I like these types of wordy informative articles. This entry was posted on 18/12/2012 by Mo Ansar in Activism, Media, UK Politics, World Politics and tagged Alpha Course, Islam, Islamophobia, JCDecaux, Liverpool Street, Marylebone, Midland Railway, Network Rail, ONS, Quran Project, Sarkozy, St Pancas, Trinitarian, Victoria, Waterloo, Xavier de Sarrau.